Some sites always appear at the top of a search result while others fail to even make it to the top ten. Wouldn’t you want to see your site on the first page of any search result? This is not easily feasible if you are depending solely on the marketing guys whom you hire for SEO. Joomla! SEO will help you to attract more visitors and improve the way you rank in search engines by giving you the techniques and knowledge to work your site into higher visitor numbers. It will help you to create and improve your site in an easy way. Joomla! is great, and you can make it perform even better by using the guidelines and ideas in this book. Search Engine Optimization is becoming a must for every web site. As the competition on the Internet grows you need to make sure your site is among the top results on the major search engines. More and more people use search engines to find the information they are looking for, so you need to make sure you show up in those search result pages to get those visitors to your web site. Joomla! SEO will provide you with a lot of information, ranging from keywords strategies through technical improvements and content creation. All this information and the tutorials provided are targeted to give you the best base for gaining higher rankings. In the book, you will learn how to build a keyword strategy and create a better site structure for SEO. You will read about technical improvements that will give you better options for SEO. There is a separate chapter that helps you create search-engine friendly and keyword-rich URLs. In the end, you will have a web site that is ready to outperform your competitors and a manual to refer to for improving every step you take. 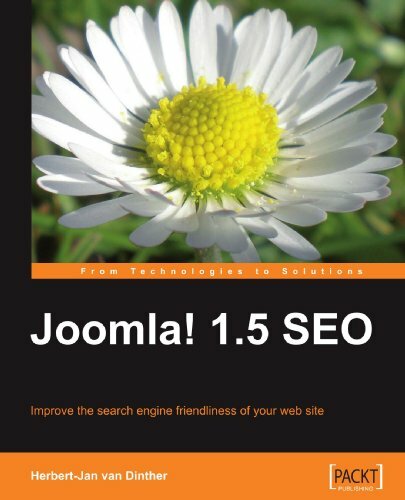 This is a practical, hands-on book that will lead you through the process of search engine optimization of your Joomla!-based web site. It provides clear instructions and detailed screenshots, so you can see exactly what to do at each step in the SEO process. Once you have finished reading the book and gone through the detailed plans from each chapter, you will have the knowledge to improve the rankings and visitor numbers of almost any Joomla!-based web site. This book is written for anyone using Joomla! ranging from owners of business sites to web site developers and personal web site owners. Any Joomla! web site owner who wants to sell products or services, or send out a message to the world will find that getting better rankings in the search engines will help them reach their goal. Some prior knowledge of Joomla! is expected but no prior knowledge of search engine optimization is needed for this book. The reader will get a deeper level of knowledge on how to make their web site rank better and attract more visitors to their site.